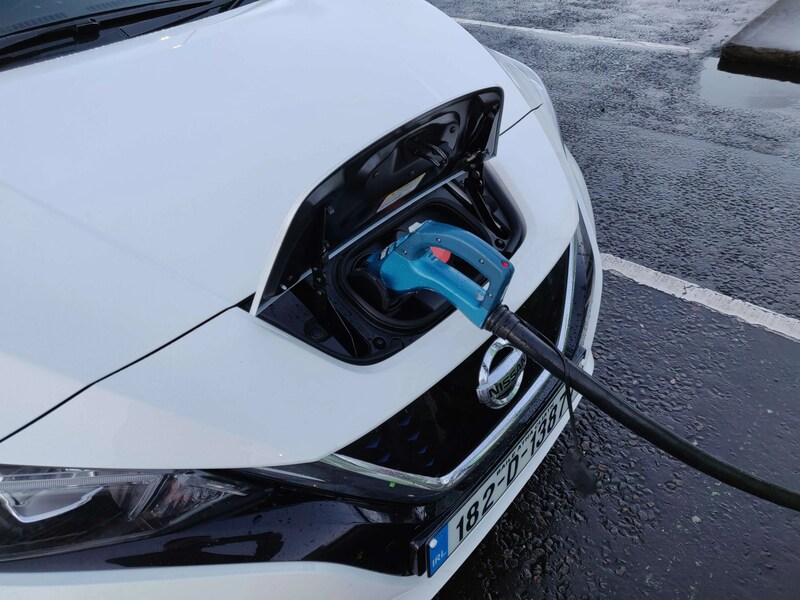 We are delighted to be kicking off our new series on electric vehicles with the best selling EV in Ireland, the new and improved Nissan LEAF v2.0. Thanks to Nissan Ireland for loaning us a 182 40kWh LEAF with all the bells and whistles (SVE model) for the week. Nissan calls this model v2.0 as the original was released back in 2010. The Nissan LEAF has sold over 300,000 thousand globally and when Robert Llewellyn from Fully Charged and Ryan from EV Opinion own one, you know it’s got pedigree. 2018 saw nearly 800 new Nissan LEAFs sold in Ireland with another 400+ used imports entering the Irish market. We’ve also heard a rumour that one is sold every 12 seconds globally. Now, being the market leader is a spot others always want to aspire to and, in January this year, the Hyundai Kona Electric pipped the LEAF out of the top spot of the best selling EV in Ireland for the month of January 2019. The v2.0 is falling more in line with the rest of the Nissan design family of vehicles. The v1.0 was a ‘like it or loathe it’ design whereas this design is much more mainstream. Those who wouldn’t pay much attention to other vehicle designs around them would assume this is a regular gas guzzling ICE (Internal Combustion Engine) car. I like the way this car looks. Some colours look better than others as is the case with most cars on the road but the glossy black C Pillar looks best in my opinion with a white body. Internally, the dash has a little bit too much hard plastics along with shiny plastics which really should not be in any dash. All that being said, the level of trim on the model we drove had really nice leather touches around the cabin with comfortable seats front and rear. Overall, we much prefer the new design over version 1.0. With so many of the first generations sold, Nissan knows what they are doing. The build quality was top quality for us. Very few squeaks and rattles. The doors give a solid clunk when closed along with the boot. The charging dock is located behind a flap/door on the grill, in the same location as the v1.0 model. 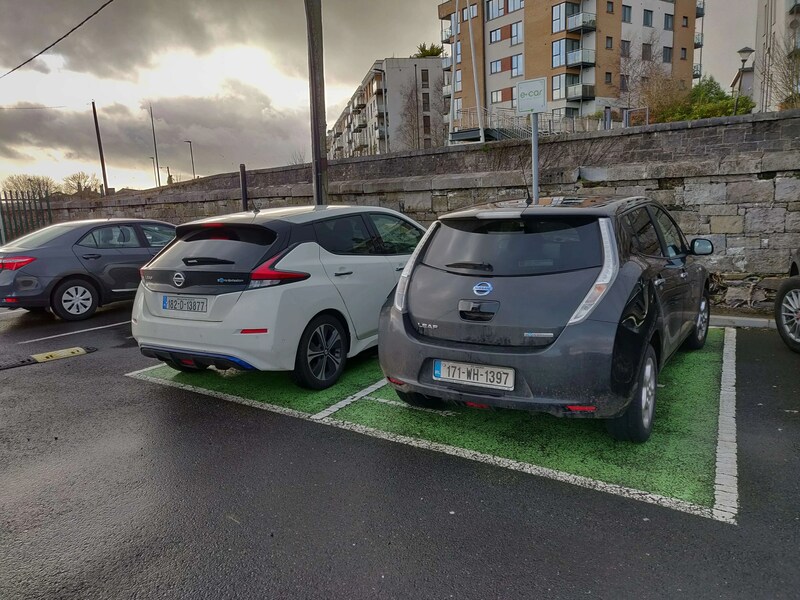 Some of the charging stations around the country make for some interesting charging situations with this positioning as like the one based in Crumlin, reversing out on to the main road after charging can sometimes be a bit daunting. Overall, it can’t be faulted in our opinion. The Nissan LEAF is full of tech as you can imagine. Firstly, away from the car itself is the NissanConnect EV App. 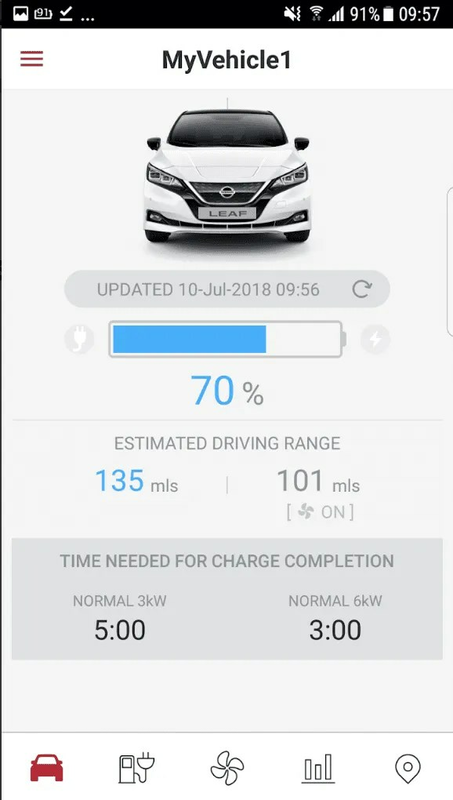 We found this really useful with features, such as what the current charge percentage was, very handy before a journey so we could plan stops. You can also see what the percentage was when the car was charging along the route. Other features include turning on or setting a time for the climate control to switch on and even locating where you parked the car. Finally, it also gives you a history of your driving and charging which was very interesting. With an app for everything these days, having one for your car is the natural progression and makes perfect sense. 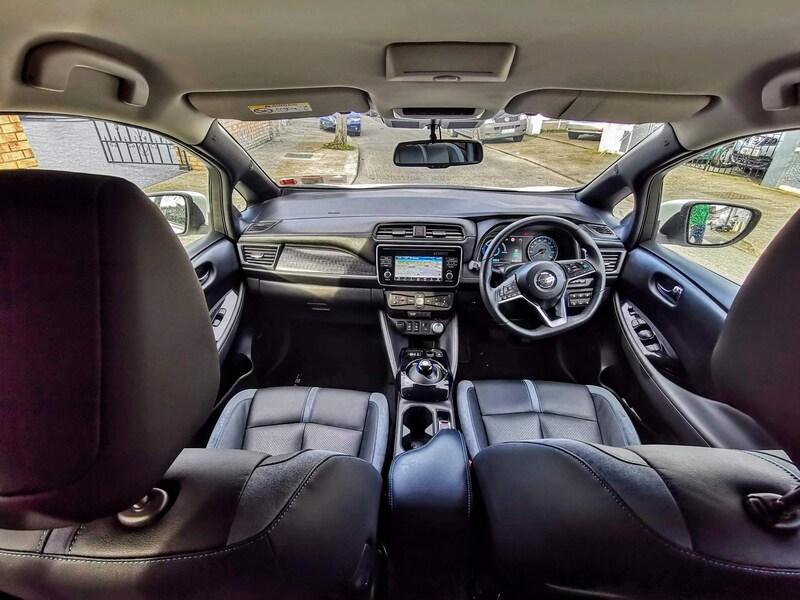 Inside the car is the usual tech with touch screens (we’d like to see a bigger and better quality screen if we’re honest) but otherwise, connectivity and usability were all good. Driving tech is where this car starts to stand out in our opinion. The transmission is automatic with your standard drive and reverse setting. With B Mode, you start getting into the world of more aggressive regenerative braking and your driving style starts to change along with slightly increasing the range by clawing back some energy. Want to add more range? 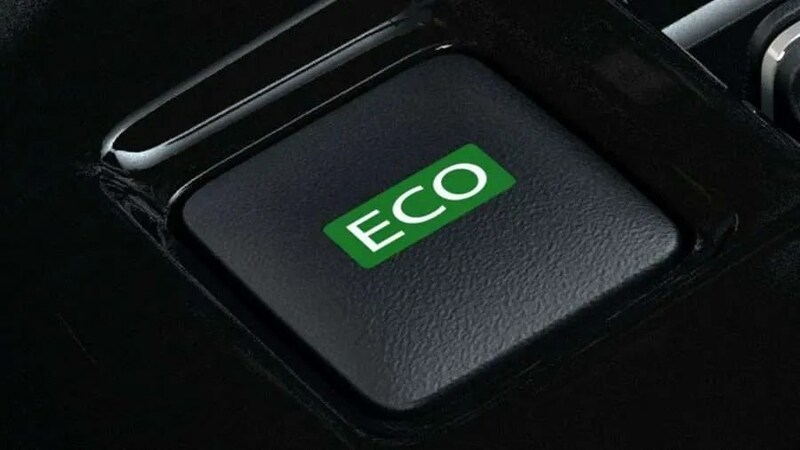 Then select ECO mode which will limit the electric motor output and increase the level of regenerative braking even more. 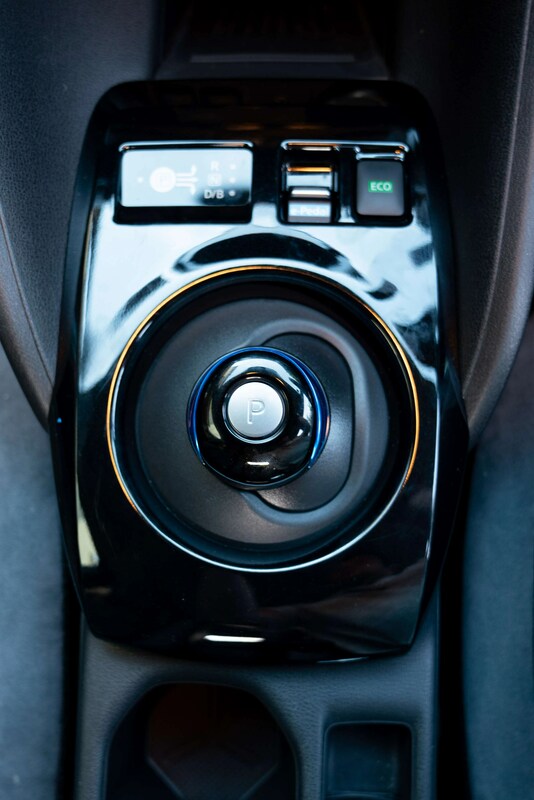 Probably our favourite piece of tech on the LEAF was the e-Pedal. This is Nissan’s play in the area of ‘One Pedal Driving’ and we loved it. Nissan claims it’s the world’s first mass-produced car with this feature. With e-Pedal, you can accelerate, decelerate and brake with a single, seamless movement. Just release the accelerator for automatic regenerative braking and depress for acceleration based on your current speed. It’s great fun and gives you much better command uphill, downhill and on winding roads. It does take some getting used to and some of the team didn’t like it at first but I was a big fan and was very disappointed driving a regular 3 pedal ICE car afterwards. Some other great tech on the car is the ProPilot features. This can be broken down into ProPilot and ProPilot Park. ProPilot will help you in city traffic and on the motorway. It can help you maintain your speed and match the traffic around you. This can speed up, and slow down including stopping. It will also stay in the lane and turn the wheel to follow the lane if the lane is not straight. ProPilot Park does exactly what it says on the tin. The car will scan the surrounding parking spaces and once it approves the size, the car will park for you, be that front in, reverse in and also parallel parking. This is one of the major factors when considering an EV. This version comes with a 40kWh battery with a WLTP (Worldwide Harmonised Light Vehicles Test Procedure) 270km range rating but this is totally dependent on driving conditions. It’s not the largest in the market and with newer competitors reaching Ireland, an upcoming battery size increase for the LEAF hopefully in 2019 (to 60kWh) will definitely help Nissan answer the concerns of those drivers with range anxiety. During the week, we drove around town and topped up the charge without any issues. Great range estimation. We also drove west to Mayo in a 400+ Km round trip and then the battery started to show its limitations. As is the way with Irish weather, the drive down was wet, windy, dark and on the motorway. Charge levels were dropping fast. If you do long range journeys on a regular basis, this may not be for you unless you have time to spare charging. As an EV driver, you need to plan and leave enough time for long distance journeys, we found this different to a normal journey and to be honest we enjoyed it. We had lunch, got some work done and stopped for coffee along the route. We were very lucky that there were DC FAST charging stations with the LEAF’s CHAdeMO port exactly where we needed them, we would need to have left a lot earlier if not. Standardisation of what the charging ports will be on EVs will settle once EVs gains more popularity. The CHAdeMO port is great with a charge of 20% to 80% in roughly 60 mins. We do feel it will be changed in future Nissan EVs in Europe to CCS (Combo 2 / Type 2) as it is becoming the standard DC fast charging in this part of the world. This will be a few years before this happens in our opinion. Timing is a beautiful thing as the Nissan LEAF was also covered on Jess Kelly’s Tech Talk podcast on Newstalk where we regularly feature. Prices start at €28,690 and you can find your local Nissan dealer here. On a final note, since driving the LEAF, we’ve seen a number of them as taxis around Dublin which is a great sign as to their build quality and range for such a demanding job. I’m sure the EV grant for taxi drivers may have also helped a little. This is our first EV review so please leave a comment with feedback on what you would like covered in future EV reviews and we may even come back and edit this review if there is something we missed. You can see why this was the best selling EV in Ireland last year. Time will tell if it can hold on to its crown.